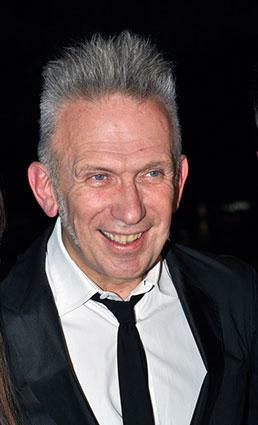 Jean-Paul Gaultier was born in 1952 in the Paris suburb of Arcueil. An autodidact, he discovered fashion at a very early age. In childhood and adolescence, television and fashion magazines fed his imagination; he was particularly fascinated by the fashion features in Elle. He served his apprenticeship as a designer from 1970 to 1975 in the most innovative couture houses of the time: Pierre Cardin, Jacques Esterel, Jean Patou, and Angelo Tarlazzi. He soon struck out on his own and presented his first show of women's fashion in 1976. Noticed and financed at first by the Japanese consortium Kashiyama, Gaultier established his own business in 1982, the success of which was continuous into the early 2000s. He developed a men's fashion line in 1984 and attracted a broader clientele through his Junior Gaultier collections, replaced in 1994 by a new JPG line. In 1992 he introduced Gaultier Jean's creations, and accessories and perfumes completed the lightning-fast rise of his business. Gaultier's fashion consecration arrived with his first haute couture collection in 1997. Investment support from Maison Hermès in 1999 enabled him to increase his reputation and his distribution, notably with the establishment of a network of boutiques bearing his name. A Parisian designer, Gaultier was deeply attached to his city, which provided the backdrop to his inspirations. Neighborhoods such as Pigalle and Saint-Germain, monuments like the Eiffel Tower and the Moulin Rouge, and the most emblematic Parisians, from Toulouse-Lautrec to Juliette Greco, fueled his imagination. In the tradition of Chanel and Saint Laurent, his clothing has made it possible for women to assert their independence in an emancipated city. From the beginning of his fashion career, London was Gaultier's second city. It very early became an immense source of inspiration, with the punk and ska movements, the allure of James Bond, and especially the flea markets and the eccentricities of Londoners. He felt a deep and enthusiastic admiration for his elder, Vivienne Westwood. The street fascinated him, providing him with the means of attaching fashion to the present and amplifying the echoes of the world around him. He has reinterpreted and made his own uses of the wardrobe of the past and its legacy in order to provide clothing for the future. The Gaultier style of the 1980s was identifiable by the famous silhouette of broad and sloping shoulders and narrow hips that emphasized stockinged legs. In the 1990s his palette of colors and materials was enriched by contact with many cultural worlds. The silhouette became more balanced, and comfort and protection took on added importance. His shows, with their exuberant and provocative staging, long obscured the fact that his clothes are designed to be worn. At the beginning of the millennium, he attained a certain classicism without renouncing the original image of his talent as the enfant terrible of fashion. Gaultier's work has been characterized by a stylistic consistency since 1976: jacket and pants constitute the basic link between male and female wardrobes. The masculinity of double-breasted jacket, fitted coat, leather jacket, overalls, trench coat, smock, and down jacket is inflected by the femininity of corset, stockings, and garters, or is enriched by Eastern touches, by the influence of caftans and djellabas. Mixtures and superimpositions make lingerie an item of clothing in itself, so that hybrid costumes like chemise-jackets and pants-skirts make up an unexpected wardrobe. Some accessories, such as ties and leotards, sewn together, become new textile materials. While women have adopted masculine attire, men are not far behind, and in Gaultier's shows they have worn skirts, corsets, and dresses with trains, increasing their masculinity. Gaultier has brought great care to textiles and employed the most luxurious materials; wool, taffeta, and velvet, for example, are blended with rayon, latex, imitation leather, and synthetic tulle. Lycra blended with traditional materials provides comfort in his designs. His designs often give fabrics a worn, faded look, as though they had already been worn. Knitwear in every form, always present, season after season, has been one of his distinctive signs. Precious fabrics enhance work clothes or military uniforms, and denim flourishes in evening dresses. Navy blue, khaki, brown, red, and deep purple-Gaultier's original colors-have in the course of time been joined by salmon and powder pink, orange, turquoise, beige, and bronze. His motifs make up a distinctive repertoire: astrology, including the bull's head from his own sign; tattoos, writing, escutcheons, Celtic symbols, and faces; and religious themes like the cross, the star of David, and the hand of Fatima, all appear in a variety of forms on his fabrics, and are printed or sewn on accessories, particularly on jewelry. Stripes, plaids, and polka dots have been fetish designs for Gaultier. Certain details are trademarks, such as fastenings for his clothes: his designs feature distinctive zippers, laces, hooks, tortoiseshell buttons, or buttons with an anchor design. A creator of images and atmospheres, Jean-Paul Gaultier could not avoid the cinema. He has created costumes for films of Peter Greenaway, Jean-Pierre Jeunet, Pedro Almodóvar, and Luc Besson. He has made stage costumes for Madonna and the dancer and choreographer Régine Chopinot. In 1993 he hosted a television show on Channel 5 in England. Jean-Paul Gaultier's strong personality and his multifaceted universe have for decades influenced the worlds of both fashion and street clothes. He has enabled people to think about the place of clothing in contemporary society. Breaking the last taboos of the late twentieth century, his designs have exalted the theme of androgyny, brought men and women closer, moved to put an end to the prejudice against age, given sublime expression to the encounter between worlds and cultures, and associated memory with the strictly contemporary. See also Caftan; Corset; Djellaba; Extreme Fashions; Hermès; Punk; Unisex Clothing. Chenoune, Farid. Jean-Paul Gaultier. New York: Universe Publishers, 1998. McDowell, Colin. Jean-Paul Gaultier. New York: Viking Press, 2001.